While growing up, Robert Olson viewed playing with a computer as equivalent to playing with any other toy. “The foundation for my passion for computers came from being exposed to video games, computers, and the Internet from a young age.” Olson, a sophomore in information and computer sciences, said. But his inspiration to pursue computer science as a career came from a person he never event meet. During 8th grade, Olson played a text-based multiplayer online role-playing game (MMORPG) called Alien Adoption Agency. He really got into the game which offered players the ability to design a personalized skin in HTML. “The guy who created the game went by the alias of Webby and I thought this guy was just incredible to have made this game that I loved so much and I told myself that I wanted to be like him,” Olson recalled. After discovering the game had been programmed in Perl, Olson, a Bakersfield native, began his journey into the world of computer programming and found it really interesting. “I would say more than any single other person, Webby, who I have never even talked to, influenced me to pursue computer science,” Olson said. Due in part to his gaming experiences, Olson had his heart set on attending the Digipen Institute of Technology in Washington state, a specialized school that offers degree programs related to the field of digital interactive entertainment technology. However Olson’s parents convinced him that it was not a good idea to get such a specialized education and he began checking out schools in California that had quality computer science programs. Olson didn’t consider himself “UC quality” as he had not finished in the top of his graduating high school class and he turned in his application to UCI on the last day, figuring he would soon get a rejection letter. Olson chose the information and computer sciences degree because of the programming projects which allow students to see how the skills they are learning are useful in the real world. “I don't think a lot of majors experience this because while they are learning a lot of information they don't really see how they can use it,” Olson said. During his freshmen year, it was Olson’s experience during the Bren School’s hITEC OCTANe product development competition that ignited his passion for entrepreneurship. The competition is designed to foster a spirit of entrepreneurship among Bren School and UC Irvine students, and fuel the development of new technologies that have the potential to positively impact the marketplace. Teaming with fellow freshmen Abhishek Amit, whom he meet in his first ICS class, the pair worked with their mentor, Bren School alumnus Gregory Moulton to come up with a workable product. “Our mentor was a lot of help because he made us think about the business side of the competition when Abhishek and I just wanted to focus on the technical side,” Olson said. The dynamic duo ended up winning the top prize of $5,000 for their Web-based integrated development environment used to write and compile source code in different languages from within a Web browser. It was a seminal moment for Olson. Even though he is only a sophomore, Olson has taken advantage of a number of internship and research opportunities the Bren School offers to its undergraduates. During the summer Olson worked as a Java programmer for The Tech Factory, a small company in Irvine. During the fall of 2006 he did research for Project RESCUE in collaboration with Motorola. Despite his hectic schedule, Olson finds time to kick back and relax with his roommates at their ocean view apartment in Newport Beach. He also takes advantage of the many classes offered at the Anteater Recreation Center. His many experiences in only his first two years at UC Irvine have shown Olson that the old cliché of try everything is true. “You don't realize how many things you miss out on just because you never try it,” Olson said. 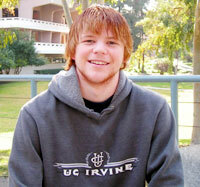 Since Robert's profile published, he has gone on to participate in many other endeavors at UCI. Of note is his first place finish in the Undergraduate Division of Staddling Yocca Carlson & Rauth Business Plan Competition. Robert has expanded his leadership skills as well, by serving as the ICS representative on Legislative Council for ASUCI and as President of the ACM CS club.